Cardiac hypertrophy occurs in up to 95% of patients with CKD and increases their risk for cardiovascular death. In the kidney, full-length membranous Klotho forms the coreceptor for fibroblast growth factor 23 (FGF23) to regulate phosphate metabolism. The prevailing view is that the decreased level of Klotho in CKD causes cardiomyopathy through increases in serum FGF23 and/or phosphate levels. However, we reported recently that soluble Klotho protects against cardiac hypertrophy by inhibiting abnormal calcium signaling in the heart. Here, we tested whether this protective effect requires changes in FGF23 and/or phosphate levels. 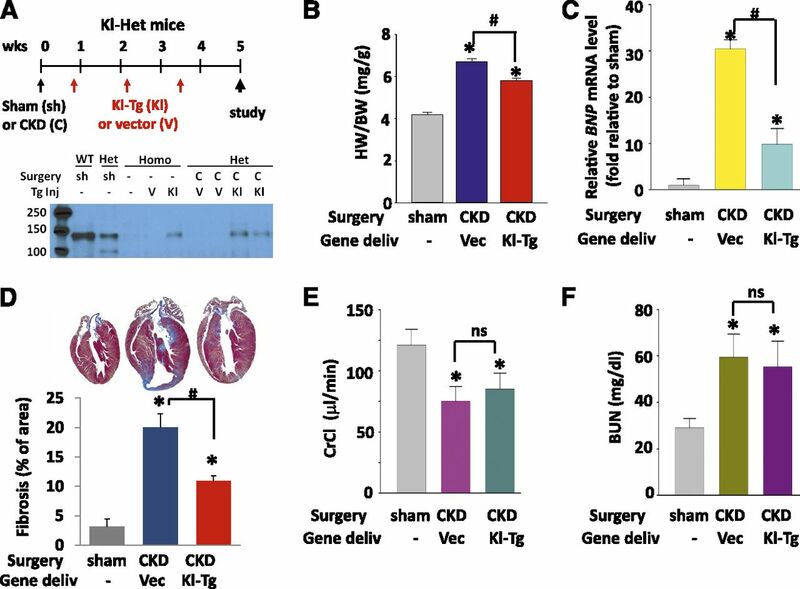 Heterozygous Klotho-deficient CKD mice exhibited aggravated cardiac hypertrophy compared with wild-type CKD mice. Cardiac magnetic resonance imaging studies revealed that Klotho-deficient CKD hearts had worse functional impairment than wild-type CKD hearts. Normalization of serum phosphate and FGF23 levels by dietary phosphate restriction did not abrogate the aggravated cardiac hypertrophy observed in Klotho-deficient CKD mice. Circulating levels of the cleaved soluble ectodomain of Klotho were lower in wild-type CKD mice than in control mice and even lower in Klotho-deficient CKD mice. 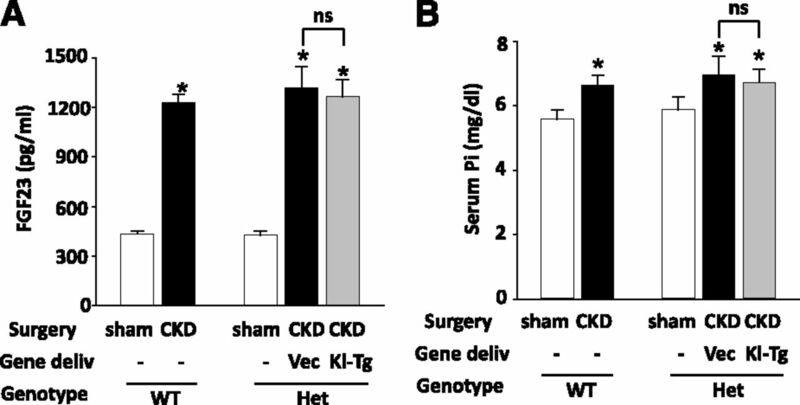 Intravenous delivery of a transgene encoding soluble Klotho ameliorated cardiac hypertrophy in Klotho-deficient CKD mice. These results suggest that the decreased level of circulating soluble Klotho in CKD is an important cause of uremic cardiomyopathy independent of FGF23 and phosphate, opening new avenues for treatment of this disease. CKD affects approximately 10% of the general population.14,15 Cardiovascular disease is the major cause of mortality for patients with CKD.15–18 Cardiac hypertrophy, occurring in up to 95% patients with CKD (also known as uremic cardiomyopathy), is an important mechanism for cardiovascular mortality by causing diastolic dysfunction, congestive heart failure, arrhythmia, and sudden death.15–18 Causes for uremic cardiomyopathy include traditional risk factors, such as hypertension and volume expansion, and CKD-specific factors that remain poorly defined.17,18 Among these factors, elevated serum FGF23 levels and phosphate retention have recently received much attention. The kidney is the major organ for production of Klotho, and CKD is known to be a Klotho-deficient state.27 Because of its important role in FGF23 and phosphate metabolism, Klotho is believed to affect cardiac growth and function indirectly through FGF23 and phosphate.11,19–22 We recently reported that soluble Klotho protects the heart against stress-induced cardiac hypertrophy by inhibiting TRPC6 channel-mediated abnormal Ca2+ signaling in the heart.28 Here, we test the hypothesis that decreases in circulating levels of soluble Klotho directly contribute to uremic cardiac disease. To examine the role of Klotho in uremic cardiomyopathy, we generated CKD by performing 5/6 nephrectomy in wild-type (WT) mice as well as mice heterozygous (Het) for hypomorphic klotho allele (kl/+). Mice homozygous for hypomorphic klotho alleles (rescued from growth defects and premature death by dietary phosphate restriction) are very susceptible to surgical death and therefore, not available for this study. To investigate the role of Klotho independently of other risk factors, we examined BP, serum phosphate levels, and hematocrit along with creatinine clearance in mice that received 5/6 nephrectomy for 4–5 weeks (Figure 1). Overall, these parameters at baseline (i.e., sham) were not different between WT and Het-klotho mice. Compared with respective sham controls, 5/6 nephrectomy for 4–5 weeks produced a similar degree of CKD in WT and Het-klotho mice. Klotho deficiency (as shown by Het-klotho versus WT CKD mice) did not affect the magnitude of alteration of BP, serum phosphate, and hematocrit induced in CKD mice. Comparable classic risk factors between WT and heterozygous Klotho-deficient CKD mice. Similar effects of 5/6 nephrectomy on (A) systolic BP (millimeters Hg), (B) creatinine clearance (CrCl; microliters per minute), (C) serum Pi (milligrams per deciliter), (D) and hematocrit (percent) of WT mice and mice Het for hypomorphic klotho allele. Mice were studied 4 weeks after 5/6 nephrectomy (CKD) or sham surgery. All values are means±SEMs. *P<0.05 versus sham. The abundance of Klotho is markedly decreased in the kidneys from patients with CKD and CKD mouse models,29–31 indicating that CKD is a Klotho-deficient state. Current commercially available ELISA assays for measurement of serum-soluble Klotho levels use unpurified serum samples that may contain interfering substances.32 To circumvent these potential problems, we developed an assay to determine serum-soluble Klotho levels. Soluble Klotho in serum samples were immunoprecipitated by anti-Klotho antibodies and analyzed by immunoblotting. For comparison, Klotho in serum samples from homozygous klotho-hypomophic mice (kl/kl) that were prespiked with known concentrations of purified recombinant Klotho proteins was also shown. Homozygous klotho-hypomorphic mice express virtually no Klotho.1,2 Serum from kl/kl mice had no detectable immunoreactive Klotho (Figure 2A). Sera from kl/kl mice prespiked with 0.2, 0.5, or 1 ng recombinant Klotho proteins exhibited a dose-dependent increase of Klotho immunoreactivity. Side-by-side comparison of WT and Het-klotho CKD mice and their sham controls revealed that serum-soluble Klotho levels were dramatically decreased in the WT CKD mice relative to the WT sham controls. Klotho levels in Het-klotho mice were about one half of those of WT mice, and they further decreased in Het-klotho CKD mice to barely detectable levels. Serum-soluble Klotho levels are decreased in CKD mice. (A) Serum samples (100 μl each) from WT and Het klotho-hypomorphic (kl/+) mice 4 weeks after CKD or sham surgery were immunoprecipitated by anti-Klotho antibodies and analyzed for the abundance of Klotho by Western blotting. For comparison, serum samples (100 μl each) from mice homozygous for the klotho-hypomorphic allele (Homo; kl/kl) prespiked with 0, 0.2, 0.5, or 1 ng purified recombinant Klotho protein (rKl; thus giving concentrations of Klotho of 0, 15, 37, and 74 pM) were similarly immunoprecipitated and analyzed by Western blotting. (B) Means±SEMs (n=5–7 per group) of soluble Klotho levels determined as described above. Concentrations of soluble Klotho in unknown serum samples were determined by comparing densities of Klotho bands with standards curves obtained using known serum concentrations of Klotho between 0 and 74 pM as shown in A. Note that serum concentrations of soluble Klotho in CKD mice fall progressively postsurgery (data not shown). Results shown here are at 4 weeks postsurgery. MW, molecular mass. *P<0.05 versus sham. #P<0.05 between indicated groups. The concentration of soluble Klotho was determined by comparing the density of Klotho bands with that in known Klotho concentrations. 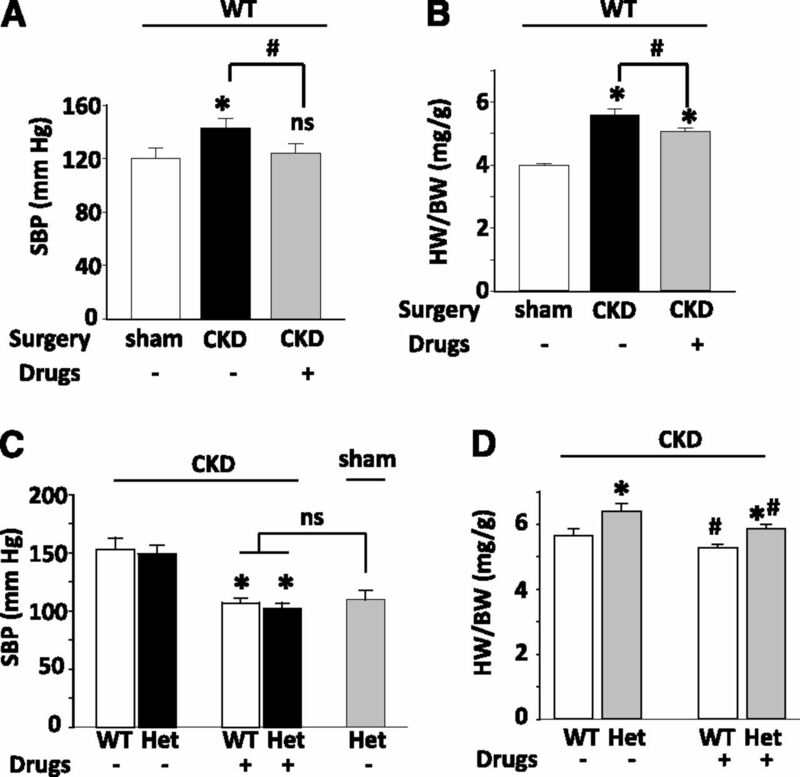 Figure 2B shows that soluble Klotho levels were 32.3±2.5 and 17.2±1.4 pM for WT sham and CKD mice, respectively, and 18.5±3.1 and 4.2±1.3 pM for Het-klotho sham and CKD mice, respectively. Thus, Het klotho-hypomorphic mice are relatively Klotho-deficient compared with WT mice (baseline serum-soluble Klotho levels are approximately 57% of those of WT mice). Soluble Klotho levels in both WT and Het-klotho groups are further decreased by 5/6 nephrectomy, such that levels in het-klotho CKD mice are only approximately 13% of those in WT sham control mice. Heart weight-to-body weight ratio, an index for analyzing cardiac hypertrophy, was not different between WT and Het-klotho sham mice (4.12±0.12 versus 4.05±0.09 mg/g). Similarly, heart weight-to-tibia length ratio, another index for cardiac hypertrophy, was not different between the two sham groups (not shown). Thus, Klotho deficiency does not cause cardiac hypertrophy at baseline. In contrast, heart weight-to-body weight ratio was significantly increased in both WT and Het-klotho CKD mice as expected for uremic cardiomyopathy (Figure 3A). The increase in Het-klotho CKD mice was significantly more prominent than that in WT CKD mice (6.26±0.25 versus 5.51±0.21 mg/g; P<0.05). Het klotho-deficient CKD mice have aggravated cardiac hypertrophy compared with WT mice. (A) Heart weight-to-body weight (HW/BW; milligrams per gram) ratio and (B) brain natriuretic peptide (BNP) expression of WT and Het-klotho mice 4 weeks after CKD or sham surgery. All CKD mice included in the study were in general good health condition with a stable body weight during the 4 weeks postsurgery. Body weight of WT and Het-klotho CKD mice were not significantly different but slightly less than the respective sham controls (32.3±1.5, 31±2, 29±1.5, and 28.4±1.2 g for WT sham, Het sham, WT CKD, and Het CKD, respectively; mean±SEM, n=6–7 each). The abundance of mRNA for BNP was measured by quantitative RT-PCR and is shown as fold relative to WT sham mice (given the value of one). All values are means±SEMs (n=6–7). *P<0.05 versus sham. #P<0.05 between indicated groups. Histologic sections of the hearts confirmed that heart size was not different between WT and Het-klotho sham mice, it was increased in both CKD mice, and the increase in Het-klotho CKD mice was more prominent than that in WT CKD mice (Figure 4A). As expected for pathologic cardiac hypertrophy,28,33–36 the expression of cardiac fetal gene brain natriuretic peptide was upregulated in hearts of both CKD groups, but the upregulation in Het-klotho CKD hearts was much more pronounced than that in WT CKD hearts (11.8±0.3-fold versus 4.7±0.4-fold; P<0.05) (Figure 3B). 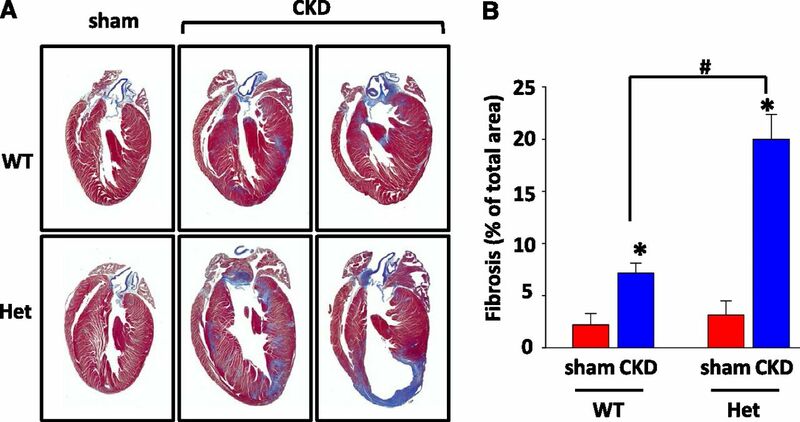 Klotho-deficient CKD mice have aggravated cardiac fibrosis compared with WT mice. (A) Representative trichrome staining of heart sections from WT and Het-klotho mice 4 weeks after CKD (shown in duplicate) or sham surgery (shown one time). Blue staining reflects collagen fibers. (B) Mean±SEM (n=6 per group) of the area of fibrosis relative to the total area of heart sections. *P<0.05 versus sham. #P<0.05 between indicated groups. Interstitial fibrosis is another consequence of uremic cardiomyopathy.17,18 There was little blue-stained fibrotic tissue in WT or Het-klotho sham hearts, but fibrosis was apparent in both WT and Het-klotho CKD hearts (Figure 4A). The degree of fibrosis in Het-klotho CKD heart was much more severe than that in WT CKD heart. Quantification of the blue-stained area confirmed this observation. The percentage of the area of fibrosis in Het-klotho CKD heart was significantly higher than that in WT CKD heart (20.8%±2.1% versus 7.4%±1.2%; P<0.05) (Figure 4B). Figure 5A shows representative cardiac magnetic resonance images (MRIs) of WT and Het-klotho mouse hearts along the long-axis and cross-section views in the end diastolic or end systolic phase. The overall heart size (shown in long-axis view) was increased in both groups of CKD mice compared with their respective controls, and the increase in CKD was more pronounced in Het-klotho CKD mice compared with WT CKD mice. The cross-section view showed that the left ventricles of Het-klotho CKD mice were relatively larger (dilated) than others in the end diastolic phase and had impaired contractility during systole. The left ventricle end diastolic volume (LVEDV) was not significantly different among WT sham, WT CKD, and Het-klotho sham mice but was markedly increased in Het-klotho CKD mice relative to Het-klotho sham mice (Figure 5B). Likewise, ejection fraction was not significantly different among WT sham, WT CKD, and Het-klotho sham mice but was significantly reduced in Het-klotho CKD mice relative to Het-klotho sham mice (Figure 5C). Het klotho-hypomorphic mice have aggravated cardiac dysfunction. (A) Representative images shown in long-axis and cross-section views during end diastolic and end systolic phases. Left ventricle (LV) and right ventricle (RV) are indicated. (B) LVEDV (calculated by three-dimensional reconstruction of serial parallel cross-sectional images) is increased in Klotho-deficient CKD hearts. (C) Ejection fraction is decreased in Klotho-deficient CKD hearts. (D) Heart mass–to-LVEDV ratio is increased in WT CKD hearts. All values are means±SEMs (n=5 each). Heart mass was 140±5, 176±6, 127±5, and 202±7 mg for WT-sham, WT CKD, Het-sham, and Het-CKD, respectively (P<0.01 CKD versus sham; P<0.05 WT CKD versus Het-CKD; not significant WT-sham versus Het-sham). *P<0.05 versus sham. Heart weight was measured from each mouse after MRI studies. Similar to Figure 3A, heart mass was significantly increased in WT and Het-klotho CKD mice relative to sham controls, and the increase in Het-klotho CKD mice was more pronounced than in WT CKD mice (see Figure 5D legend). When normalized to the LVEDV, the ratio of heart mass to LVEDV was significantly increased in WT CKD mice relative to sham mice (Figure 5D). Thus, WT CKD mice have ventricular hypertrophy, normal chamber size, and preserved contractility, which is indicative of diastolic dysfunction. In contrast, although heart mass is markedly increased in Het-klotho CKD mice, because of the increase in LVEDV, heart mass–to-LVEDV ratio was unchanged compared with sham control (Figure 5D). Together with results of decreased ejection fraction, these results indicate that hearts of Het-klotho CKD mice have progressed to systolic dysfunction with dilated cardiomyopathy and impaired contractility. Figure 1 supports that Klotho deficiency does not induce uremic cardiomyopathy through alteration of BP, serum phosphate, and hematocrit levels. Whether the cardioprotective effect of Klotho is entirely independent of these factors remains unknown and is the subject of the next series of experiments. BP was elevated in WT CKD mice versus sham mice, and treatment with antihypertensive drugs normalized BP of CKD mice to the level of sham control mice (Figure 6A). Normalization of BP only partially rescued cardiac hypertrophy in CKD (Figure 6B), indicating that factors other than hypertension contribute to cardiac hypertrophy in our CKD mouse model. The antihypertensive regimen normalized BP of WT CKD mice and Het-klotho CKD mice equally (to the level of sham mice) (Figure 6C). Despite some reduction for both groups, the heart weight-to-body weight ratio remained significantly higher in Het-klotho CKD mice than in WT CKD mice (Figure 6D). Thus, Klotho deficiency aggravates cardiac hypertrophy independently of the effect of hypertension. Klotho deficiency aggravates cardiac hypertrophy in CKD independently of effects on BP. (A) Systolic BP (SBP) of WT mice 4 weeks after CKD or sham surgery treated with or without antihypertensive drugs. Drugs were given in drinking water 5 days postsurgery. 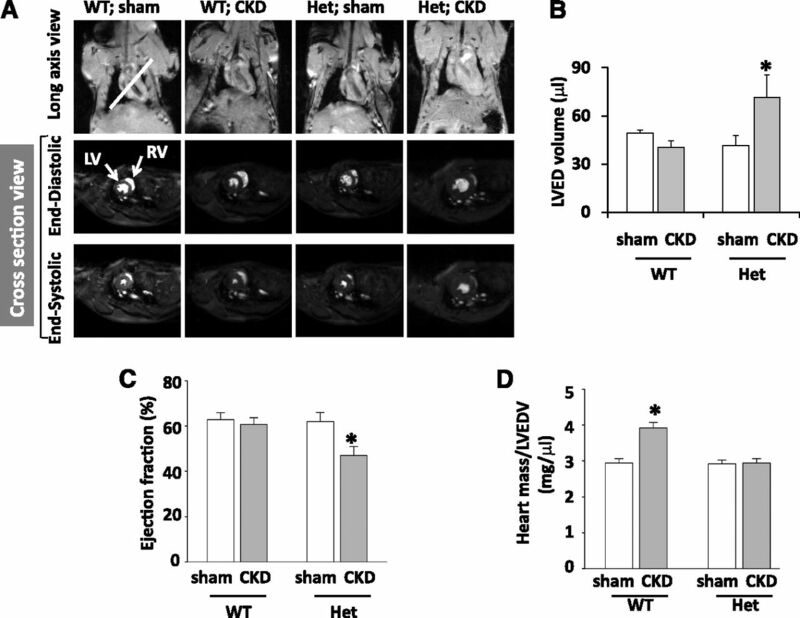 The treatment normalizes elevated BP in CKD mice to the level of sham mice. *P<0.05 versus sham; #P<0.05 between indicated groups. (B) Heart weight-to-body weight (HW/BW) ratio of the mice described in A. The antihypertensive treatment attenuates but does not completely abrogate cardiac hypertrophy in CKD mice. All values are means±SEMs (n=6–7 each). *P<0.05 versus sham; #P<0.05 between indicated groups. (C) SBP of WT and Het-klotho mice 4 weeks after CKD surgery treated with or without antihypertensive drugs. Treatment with antihypertensive drugs normalizes BP in both WT and Het-klotho CKD mice to the level of sham mice. All values are means±SEMs (n=7–8 each). *P<0.05 versus no drug treatment. (D) HW/BW ratio of mice described in C. Note that, although antihypertensive treatment significantly decreases HW/BW ratios in both WT and Het-Klotho CKD mice, the ratio in Het-Klotho mice remains elevated compared with WT mice. All values are means±SEMs (n=7–8 each). *P<0.05 Het versus WT; #P<0.05 treatment versus no drug treatment. We used dietary phosphate restriction to control phosphate retention and serum phosphate (Pi) and FGF23 levels. As in Figure 1C, serum Pi levels were equally elevated in WT and Het-klotho CKD mice compared with sham controls but not different between the two CKD groups (Figure 7A). Dietary phosphate restriction lowered serum Pi levels equally (to the levels of sham controls for both WT and Het-klotho CKD mice) (Figure 7A). Serum FGF23 levels were increased in both CKD groups, and dietary phosphate restriction lowered the levels close to those of sham mice (Figures 7B, see 9A for FGF23 levels of sham). Notably, this low-Pi diet treatment did not significantly alter cardiac hypertrophic response in WT or Het-klotho CKD mice (Figure 7C). Normalization of serum phosphate and FGF23 levels by dietary phosphate restriction does not prevent Klotho deficiency–induced aggravated cardiac hypertrophy in CKD mice. WT and Het-klotho mice after CKD or sham surgery were fed a low-Pi (0.2% inorganic phosphate) or a normal Pi (nl Pi; 0.35% inorganic phosphate) diet starting on day 5 postsurgery. (A) Serum phosphorus level, (B) serum FGF23 level (picograms per milliliter), and (C) heart weight-to-body weight (HW/BW) ratio were analyzed at 4 weeks after surgery. Note that, although feeding a low-Pi diet normalizes serum phosphate and FGF23 levels in both WT and Het-klotho CKD mice to the same levels of sham mice fed an nl Pi diet, it does not prevent aggravated CKD-induced cardiac hypertrophy in Het-klotho versus WT mice. All values are means±SEMs (n=7–8 each). In panel A, *P<0.05 CKD versus sham; #P<0.05 CKD on low-Pi diet versus CKD on nl Pi diet; not significant (ns) for WT versus Het in low-Pi diet as indicated. In panel B, *P<0.05 WT or Het on low-Pi diet versus WT or Het on nl Pi diet. In panel C, *P<0.05 Het versus WT. Next, we designed experiments for transient delivery of soluble Klotho in CKD mice. Het-klotho mice were injected through the tail vein of the klotho transgene or empty vector at days 5, 15, and 25 after 5/6 nephrectomy or sham surgery and analyzed at approximately day 35 (Figure 8A). Klotho protein was detected in the serum of homozygous klotho-hypomorphic mice only after injection of klotho transgene but not in these mice without injection or injected with the empty control vector (Figure 8A). The serum levels of Klotho in homozygous klotho-hypomorphic mice injected with klotho transgene were lower than the endogenous levels detected in WT and Het-klotho mice. Tail-vein injection of klotho transgene, nonetheless, significantly increased the levels of Klotho in serum of Het-klotho CKD mice, which were otherwise hardly detectable for Klotho. Transgenic expression of soluble Klotho attenuates cardiomyopathy in Klotho-deficient CKD mice. (A, upper panel) Experimental protocol for transgenic expression of Klotho by tail-vein injection of soluble Klotho–expressing (Kl-Tg) plasmid. Het klotho-deficient mice received CKD or sham surgery. The pilot study showed that tail-vein injection of a transgene encoding soluble Klotho in mice produced circulating Klotho detectable from 24 hours to about 2 weeks after injection and peaked at about days 2–4 after injection (data now shown). Thus, cytomegalo virus promoter (pCMV)–driven Kl-Tg plasmid or empty vector (V) was injected through the tail vein in mice at days 5, 15, and 25 after surgery. Mice were euthanized and studied at day 35 postsurgery. (A, lower panel) A representative image of immunoblot analysis of serum samples. Serum samples from Het-klotho CKD (C); mice at day 28 after (3 days after last injection of vector [V] or Klotho-transgene [Kl]) were analyzed for Klotho levels by immunoprecipitation and Western blotting as described in Figure 2. For comparison, the following serum samples were also included in the analysis: samples from homozygous klotho (Homo) mice (no surgery) that received either no injection or a single injection of Kl-Tg or vector for 3 days and samples from WT and Het klotho mice that received sham surgery but no transgene injection. Note that serum Klotho levels in Het-klotho CKD mice are barely detectable (Figure 2A), but levels are increased by injection of Klotho-expressing transgene. Inj, injection. (B) Heart weight-to-body weight (HW/BW) ratios of Het klotho-hypomorphic CKD mice injected with Klotho-expressing plasmid (Kl-Tg) or vector (Vec) compared with that of sham mice without injection. Note that transgenic expression of Klotho partially rescues cardiac hypertrophy in CKD mice. (C) Hypertrophic marker brain natriuretic peptide (BNP) mRNA levels in the same groups of mice in B were measured by quantitative RT-PCR and plotted as fold relative to that in sham mice (given value of one). (D) Representative trichrome-stained heart sections from mice as described in B and quantification of the area of fibrosis relative to the total area. (E) Creatinine clearance (CrCl) and (F) BUN (milligrams per deciliter) of mice as described in B. All values are means±SEMs (n=7–8 each). Gene deliv, gene delivery. *P<0.05 versus sham. #P<0.05 between indicated groups. Tail-vein injection of klotho transgene significantly ameliorated cardiac hypertrophy in Het-klotho CKD mice (Figure 8, B and C). Histologic study confirmed that the increase in heart size in CKD was smaller and that cardiac fibrosis was less severe in klotho transgene–injected compared with empty vector–injected CKD mice (Figure 8D). Transgenic expression of klotho in CKD mice had no effect on creatinine clearance, BUN (Figure 8, E and F), serum Pi, FGF23 (Figure 9), BP, or hematocrit (data not shown). Transgenic expression of Klotho does not alter serum FGF23 and phosphate levels in CKD mice. (A) Serum FGF23 and (B) phosphate levels of WT and Het-klotho mice receiving tail-vein injection of Klotho-expressing transgene (Kl-Tg) or empty vector (Vec) or no injection after 4 weeks of CKD or sham surgery. Protocol for injection of Klotho-expressing transgene is as described in Figure 8A. Note that FGF23 and phosphate levels are both elevated in CKD mice, but there is no difference between Het-Klotho CKD mice injected with Kl-Tg and Vec. All values are means±SEMs (n=7–8 each). Gene deliv, gene delivery. *P<0.05 versus sham. The expression of TRPC6 in hearts is upregulated in diverse causes of pathologic cardiac hypertrophy, which plays a critical role in amplifying and sustaining the disease process.28,33–36 We found that TRPC6 transcript was increased in uremic hearts, which was aggravated in Het-klotho CKD versus WT CKD mice (Figure 10A). 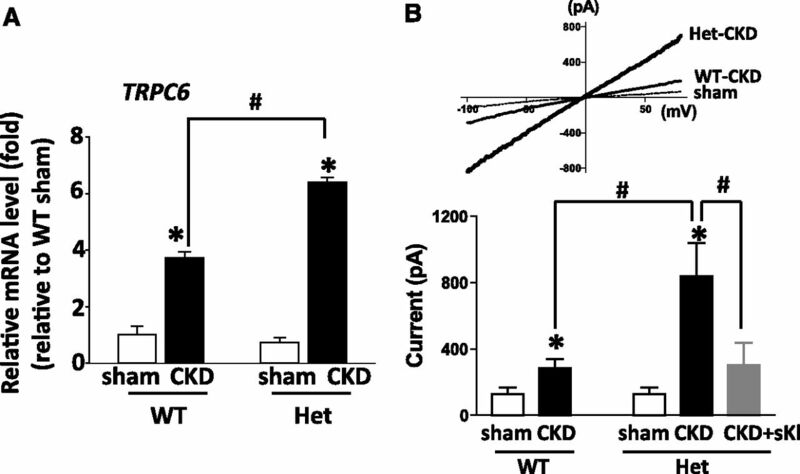 Functional TRPC6-mediated currents were increased in cardiac myocytes isolated from CKD mice (versus sham), and the increase was more pronounced in Het-klotho CKD versus WT CKD (Figure 10B). To support that Klotho deficiency contributes to the enhanced TRPC6 current, extracellular application of soluble Klotho decreased the currents. CKD induces upregulation of cardiac TRPC6, which is aggravated by Klotho deficiency. (A) TRPC6 mRNA levels (measured by RT-PCR) in the hearts of WT and Het-klotho mice who had sham or CKD surgery. All values are means±SEMs (n=7–8 each). (B) TRPC6-mediated currents were recorded from cardiac ventricular myocytes freshly isolated from mice as indicated. Currents were recorded in ruptured whole-cell mode. Voltage protocol consists of holding at −40 mV and repetitive descending ramp pulses from +120 to −120 mV. This protocol diminishes the activation of Nav. Bath solution contains inhibitors for L-type Cav channel (Nifedipine; 1 μM) and Na+-Ca2+ exchanger (NiCl2; 3 mM). Currents were recorded before and after the addition of endothelin-1 (ET1; 20 nM), and ET1-activated currents are shown. Upper panel shows representative current-voltage relationships of ET1-activated currents. Lower panel shows ET1-activated inward current (at −100 mV). Where indicated, purified recombinant soluble Klotho (sKl; 200 pM) was added and incubated for 2 hours before ruptured whole-cell recording. All values are means±SEMs (n=7–8 each). *P<0.05 versus sham; #P<0.05 between indicated groups. Uremic cardiomyopathy is the main cause of death for patients with CKD. CKD-specific risk factors for uremic cardiomyopathy remain poorly defined.17,18 Here, we show that soluble Klotho is a novel circulating cardioprotective factor and that decrease in the levels in CKD is an important mechanism for uremic cardiomyopathy in mice. FGF23 excess and phosphate retention have received much attention as important risk factors for uremic cardiomyopathy. In our studies, Het klotho-deficient CKD mice have the same elevated serum levels of phosphate and FGF23 as WT CKD mice but have worse cardiomyopathy. Normalization of serum phosphate and FGF23 by dietary phosphate restriction does not abrogate aggravated cardiomyopathy in Het Klotho-deficient CKD mice. Moreover, transgenic expression of soluble Klotho ameliorates cardiomyopathy in Klotho-deficient CKD mice without affecting phosphate and FGF23 levels. Thus, a decrease in soluble Klotho contributes to uremic cardiomyopathy independently of FGF23 and phosphate. The magnitudes of phosphate retention and FGF23 excess are relatively modest versus those in patients with advanced CKD; our findings do not argue against phosphate retention and FGF23 excess causing uremic cardiomyopathy. 1,25–Dihydroxyvitamin D deficiency, hyperparathyroidism, insulin resistance, and uremic toxin indoxyl sulfate, etc. have also been proposed to contribute to uremic cardiomyopathy.17,18,37,38 However, Klotho-deficient mice have elevated 1,25–dihydroxyvitamin D levels (which are expected to suppress the renin-angiotensin-aldosterone system) and heightened insulin sensitivity.2,39 Het Klotho-deficient mice have no disturbance in parathyroid hormone secretion compared with WT mice.40 Moreover, the magnitudes of renal failure and hyperphosphatemia were not different between WT CKD and Het Klotho-deficient CKD mice in our studies. Thus, it is unlikely that these risk factors account for the aggravated cardiomyopathy observed in our Klotho-deficient CKD mice. Previously, we found that Klotho-deficient mice have no baseline cardiac hypertrophy but develop exaggerated cardiac hypertrophy in response to stress by isoproterenol overstimulation.28 Here, we further found that, at baseline, Klotho-deficient hearts are not different from those in WT mice, but hearts in Klotho-deficient CKD mice are more severely hypertrophic compared with hearts in WT CKD mice. Thus, we conclude that Klotho deficiency does not cause the heart to grow at baseline to develop spontaneous cardiac hypertrophy, but rather, it renders the heart susceptible to stress-induced injury and development of aggravated cardiac hypertrophy in response to stress. Recently, Agarwal et al.41 also found that Klotho-deficient mice do not have cardiac hypertrophy at baseline; Faul et al.,21 however, found that Klotho-deficient mice have cardiac hypertrophy at baseline. Reasons for these differences are unknown but conceivably may be because of differences in genetic background of mice and/or susceptibility to stress. How does Klotho protect the heart against stress-induced injury? Cardiac stress causes abnormal intracellular Ca2+ signaling in the heart, including activation of calcium-dependent phosphatase calcineurin to dephosphorylate nuclear factor of activated T cells (NFAT), which leads to nuclear translocation of NFAT to induce fetal gene expression and pathologic cardiac hypertrophy and remodeling.35,36 The TRPC6 gene contains NFAT-responsive elements in the promoter, and its expression in the heart is upregulated by stress.28,33,34 The increased Ca2+ influx through TRPC6 causes a feed-forward cycle of gene expression, and it further amplifies and sustains the process.28,33–36 Previously, we have found that soluble Klotho inhibits cardiac TRPC6 currents activated by stress.28 Here, we show that expression of TRPC6 and TRPC6 channel activity are upregulated in uremic hearts and that soluble Klotho inhibits the induced TRPC6 currents. Thus, inhibition of stress-induced TRPC6-mediated gene amplification loop by soluble Klotho likely underlies cardioprotection in uremic hearts. Other additional mechanisms are also possible. Because phosphate retention can cause cardiovascular toxicities and because increased circulating FGF23 is critical for countering phosphate retention in CKD, a general FGF23 blockade may not be effective in protecting against cardiovascular mortality in patients with CKD.42,43 In this regard, our report that soluble Klotho deficiency is an important independent risk factor for uremic cardiomyopathy raises new hopes that Klotho replacement may be an effective treatment for uremic cardiac disease. Soluble Klotho has also been found to be protective against vascular calcification through mechanisms that involve direct effects on vascular smooth muscle cells and indirectly through phosphate metabolism.31 Vasculoprotection may be an additional benefit of Klotho replacement therapy in CKD-associated cardiovascular disease. A one-step partial nephrectomy was performed as previously described44 with minor modifications. Briefly, after midabdomen incision, the left kidney was exposed with Q-Tips, and the entire upper and lower poles of the left kidney were cauterized, leaving an approximately 5-mm intact segment around the hilum. Thereafter, the right ureter and pedicle were ligated with suture, and the right kidney was removed. Twenty-four–hour urine was collected from live unrestrained animals using metabolic cages.28,45 Blood drawn from mice using the retro-orbital bleeding method was kept on the laboratory bench at room temperature for 1 hour and then centrifuged at 5000 rpm for 5 minutes. Supernatant was collected as serum samples and stored in −20°C. Urine and serum creatinine values were measured by capillary electrophoresis using a capillary electrophoresis system equipped with a diode array detector (Beckman Instruments, Fullerton, CA) as previously described.45 BUN was measured using an autoanalyzer.28,45 Serum phosphate and FGF23 levels were measured using a phosphate assay kit (Stanbio Labs, San Antonio, TX) and FGF23 ELISA kit (Immutopics), respectively.28 Spun hematocrit was determined by centrifugation of whole blood in heparinized capillary tubes using the microhematocrit centrifuge (LWS-M24; LW Scientific). Soluble Klotho protein in serum was immunoprecipitated and detected by Western blotting as described with modification.46 Mouse serum (0.1 ml) was mixed with 10 μl 10% SDS and heated at 100°C for 4 minutes; then, it was diluted with 0.4 ml 1% Triton X-100 in PBS (pH7.4) and centrifuged at 14,000 rpm for 4 minutes. The resulting supernatant was incubated with 2 μg anti-Klotho antibody (goat anti-mouse Klotho; AF1819; R&D Systems) at 4°C overnight and then incubated with 20 µl protein-G Agarose (Thermo Scientific) at 4°C for 2 hours for precipitation. The precipitate was washed three times with 1% Triton X-100 in PBS (pH 7.4) and one time with PBS (pH 7.4), mixed with SDS-PAGE sample buffer, and subjected to 8% SDS-PAGE. After transferring onto a nitrocellulose membrane, Klotho was detected using anti-Klotho rat mAb (KM2076),31 and the density of immunoreactive Klotho bands was analyzed by ImageJ software. Concentrations of soluble Klotho in unknown serum samples were determined by comparing the density of Klotho-immunoreactive bands with that from known Klotho concentrations at 0, 15, 37, and 74 pM. Serum samples with known Klotho concentrations were prepared by adding 0, 0.2, 0.5, or 1 ng purified recombinant Klotho protein prepared as previously described2,5,8 to 100 μl serum from homozygous klotho-hypomorphic mice (which contain virtually no detectable Klotho). These samples of known Klotho concentrations were immunoprecipitated and analyzed by Western blotting and ImageJ software in the same way as the unknown samples. RNA was extracted from heart samples with Trizol (Invitrogen) and reverse transcribed into cDNA (Taqman Reverse Transcription Reagents; Applied Biosystems-Roche), and mRNA abundance was analyzed by real-time PCR with SYBR-Green (iTaq or iQ SYBR-Green Supermix; BioRad). Primers: glyceraldehyde-3-phosphate dehydrogenase, tgcaccaccaactgcttagc, ggcatggactgtggtcatgag; brain natriuretic peptide, ccaaggcctcacaaaagaac, agacccaggcagagtcagaa; TRPC6, cgctgccaccgtatgg, cgccggtgagtcagt. Dissected hearts were rinsed in PBS and incubated in Krebs–Henseleit solution lacking Ca2+ for 30 minutes, and then, they were fixed in 4% paraformaldehyde overnight at room temperature. Samples were dehydrated and stored in 50% ethanol, mounted in paraffin, and sectioned. Sections were then stained with hematoxylin and eosin or Masson’s Trichrome stain. Quantification of fibrosis in the heart was done with ImageJ software. Cardiac MRI of mice was performed in the Mouse MRI Core Facility of the University of Texas Southwestern Medical Center as previously described.28 To determine the left ventricular volume, multiple parallel slices of 1-mm thickness perpendicular to the long heart axis were imaged. The area of left ventricular of each slice at both end diastolic and end systolic phases was measured using ImageJ software. Left ventricular volume was calculated as the sum of area of all slices at either phase. Stroke volume is the difference between end diastolic and end systolic volumes. Ejection fraction is the percentage of stroke volume over end diastolic volume. The klotho transgene plasmid, pCDNA3-sKlotho, contains cDNA coding for the full-length extracellular domain of rat Klotho under the control of the cytomegalovirus promoter. The transgene plasmid or empty vector plasmid was diluted with Mirus TransIT-QR solution at 10 μg/ml (in volume approximately 5% of body weight) and injected through the tail vein into CKD mice at days 5, 15, and 25 after 5/6 nephrectomy or sham surgery. Ventricular myocytes were freshly isolated from mouse hearts as previously described.28 Isolated myocytes were stored at room temperature for up to 6 hours until use. Ruptured whole-cell currents of isolated myocytes were recorded under voltage clamp using the voltage protocol that consists of holding at −40 mV and repetitive descending ramp pulses from +120 to −120 mV for 500 milliseconds applied every 10 seconds.28 The pipette solution contained 9.4 mM NaCl, 120 mM CsCl, 1 mM MgCl2, 3.5 mM CaCl2, 10 mM BAPTA, 10 mM Hepes, and 0.2 mM NaGTP (pH 7.2; calculated ionized [Ca2+] approximately 80 nM), and the bath solution contained 140 mM NaCl, 5 mM CsCl, 1 mM MgCl2, 1.2 mM CaCl2, 10 mM glucose, and 10 mM Hepes (pH 7.4). Bath solution also contained 1 μM nifedipine and 3 mM NiCl2 to block current flow through the L-type Ca2+ channel and the Na+/Ca2+ exchanger, respectively. The pipette resistance was approximately 2–3 MΩ when filled with the pipette solution. Whole-cell access resistance was <10 MΩ. Endothelin-1 (20 nM) was administrated using the focal application method. The distance between the tip of the applicator and the myocyte was <50 μm. Currents were low-pass filtered at 2 kHz and sampled every 0.1 milliseconds. Data acquisition was performed using the pClamp9.2 program (Axon Instrument, Inc.), and analysis was performed using Prism (version 3.0) software (GraphPad Software, San Diego, CA). Statistical comparison was made between control and experimental groups conducted during the same time period. Each experiment was repeated at least one time at separate times with similar results. Data are presented as means±SEMs. Statistical comparisons between two groups of data were made using the two-tailed unpaired t test. Multiple comparisons were determined using one-way ANOVA followed by Tukey multiple comparison tests. We thank Masaya Takahashi for cardiac magnetic resonance imaging and Orson Moe for discussions and comments. This work was supported by National Institutes of Health Grants R01-DK85726, R01-DK100605, and P30-DK79328. C.-L.H. holds the Jacob Lemann Professorship in Calcium Transport at the University of Texas Southwestern Medical Center.